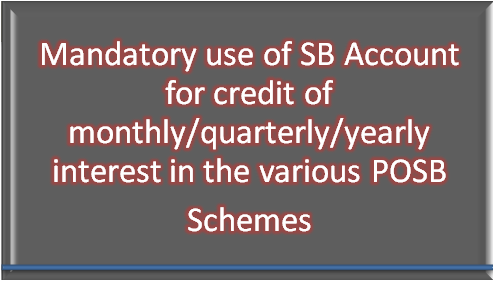 Mandatory use of Savings Account for credit of maturity/premature value, monthly/quarterly/yearly interest in case of MIS/SCSS/TD accounts and investments from 01st December, 2017. Subject: Mandatory use of Savings Account for credit of maturity/premature value, monthly/quarterly/yearly interest in case of MIS/SCSS/TD accounts and investments from 01st December, 2017. "The above orders will be implemented w.e.f. 15th December. 2017 instead of 1st December, 2017". 2. This may kindly be circulated to all CBS and non-CBS Post Offices for information and necessary guidance for staff and customers. 3. The Circles are advised to take proactive measures & necessary steps in order to ensure that business'opportunities & revenue of the Department are not affected adversely due to implementation of the order. If need be, the Small Savings Agents may also be involved to convince to the deposit for proper implementation of the orders. 4. This issues with approval of competent authority.